Italy might be far, far away but there’s no stopping us from enjoying a slice of it. Especially when restaurants and chefs, in the city, are going that extra mile to perfect traditional Italian recipes. From crostinis to pastas and tiramisu – here are the restaurants that best celebrate the flavours of Italian cuisine. 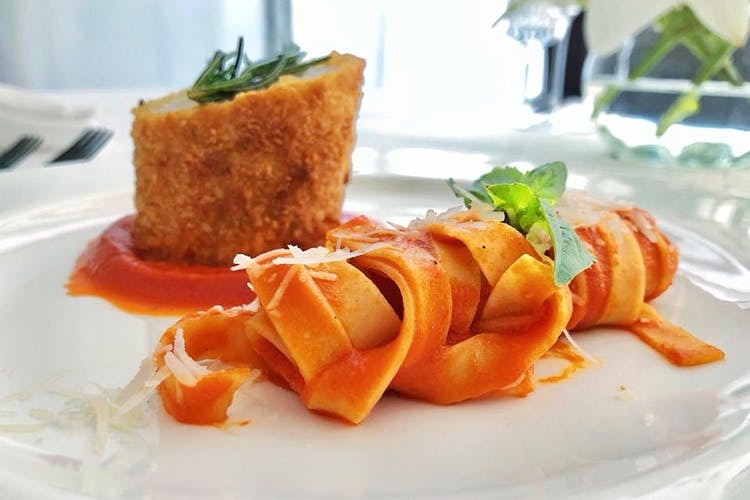 Treat yourself to hearty Italian repast at this luxurious restaurant. The Arancini comes stuffed with seasonal vegetables and a tangy Italian tomato sauce. While the Prosciutto e Melone features pricey Italian Ham along with melon and a balsamic reduction. For mains, be prepared to be blown away by the Orecchiette al Ragu – homemade pasta that’s topped by a 48-hour, slow-cooked lamb ragout and parmesan cheese. There’s also the equally impressive Scaloppine di Pollo where chicken is cooked with sage and fontina cheese and comes in a white wine sauce. For dolci, the Italian Almond Chocolate Cake served with mascarpone ice cream is a must. This restaurant’s eclectic menu hops across a few continents and plants a flag firmly in Italy too. Fill up on Goat Cheese Crostinis, Lamb Lasagna, and Spaghetti Carbonara. Many patrons have also given a thumbs-up to he Angel Hair Pasta with basil, garlic and tomatoes and the penne with pine nuts, and arugula. End your meal on a high note with a silken tiramisu. Their Kora and Indiranagar outlets are our favourites. Chianti is perfect for an Italian meal that’s replete with familiar and comforting flavours. Kick off your culinary journey to Italy with helpings of Prosciutto E Melone (slices of pink ham served with fresh melon and a tangy dressing) and Arancini Di Sicilia (bread-crumbed, rice croquettes). Their Pasta offerings plenty of variety and combine delicious flavours like fettuccine mixed with Italian ham and a creamy, mushroom sauce. The Grilled Lamb Chops with Rosemary Potatoes and the Roasted Duck with Mushroom Risotto – are also excellent choices for the main course. One of the best Italian restaurants in Indiranagar, Flying Spaghetti Monster serves up a robust menu that’s sprinkled with comforting flavours. Begin your meal with spoonfuls of Crostini Al Forno where artichokes, mozzarella, olives and capers are doused in a napoletana sauce. You can also enjoy crepes stuffed with mushrooms and besciamella sauce along with the classic Aglio Olio. If Alba is a bit too far and pricey for you, then, head over to Alto Vino at this other Marriott property. The chefs here will whip you up delights like the Fritto Misto – batter fried shrimps and calamari in a spicy, tomato sauce. You can then kick your meal into high gear with a refreshing plate of Sorrentina where spaghetti is adorned with burrata and basil. You can also go for the Filleto Di Manzo – a juicy tenderloin fillet drizzled with jus and served with mashed potatoes. The Roman Pine Nut Tart and the traditional Panna Cotta end your meal on a high note, for sure. A chain restaurant they might be but their inventive menu has proved to be a crowd-puller wherever they go. Made with the raisin and herb crumbed zucchini and and buffalo mozzarella and served with a green salad and red pepper coulis, the Mozzarella & Zucchini Fritti impresses. And so does the Rigatoni Con Melanzane E Ricotta – pasta that’s generously slathered with a tomato cream sauce that includes roasted eggplant, bell peppers, olives and ricotta. The Slow Braised Lamb Shanks and the Rosemary Beef Fillet Steak are worth their calories too! This cosy Koramangala restaurant is a great place for a date with bae and a fine, Italian meal. After sampling the smoked salmon rolls and the beef carpaccio, we recommend you set your eyes on the creamy Spinach and Ricotta Ravioli or the Baked Chicken Pesto that’s made delicious with pesto, mozzarella and tomato. Round up your meal with their highly-recommended Tiramisu or the Almond Semifreddo. Tiamo is the place for a romance-loaded, Mediterranean meal where the Italian offerings serve as the highlight. You can look out to sweeping views of the city while savouring the Wild Mushroom And Celery Risotto and the Linguini Seafood. Finish up with the Cannoli – that come with a luscious ricotta and mascarpone filling. This cheery bar’s menu has more than a sprinkling of Italian creations that are worth trying. The Ricotta Fritters and the Italian Shrimp Balls make for great accompaniments to your tipple. You can follow this up with the Smoked Salmon Pasta and Saffron Risotto.